This CellML version of the model has been checked in COR and OpenCell. The units are consistent and the model runs to partially recreate the published results. The infusion of glucose and insulin, and the insulin response, are the same as in the paper, but the glucose oscillations are different - this may be because the time delays in the original model can not be included in the CellML model. Abstract: Several insulin therapies are widely in clinical use with the basic strategy that mimics insulin secretion in a normal glucose-nsulin endocrine metabolic regulatory system. In this paper, we model the insulin therapies using a delay differential equation model. We study the dynamics of the model both qualitatively and quantitatively. The analytical results show the existence and uniqueness of a stable periodic solution that corresponds to ultradian insulin secretion oscillations. Numerically we simulate the insulin administration based on our model. The numerical simulation results are in agreement with findings of clinical studies. 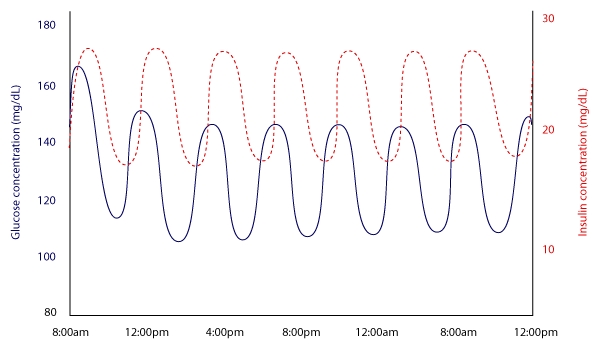 Glucose (blue solid line) and insulin (red dotted line) concentrations oscillate over time, with a slight time delay between the peaks as insulin spikes in response to elevated glucose levels. Derived from workspace Wang, Li, Kuang, 2007 at changeset b0afdb9fbe31.